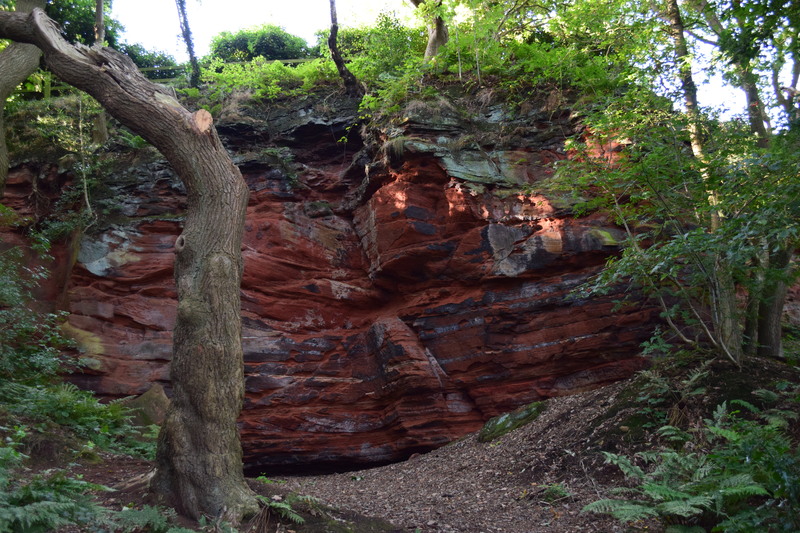 The Sandstone Trail is undisputedly one of the most popular walks in North West England. At 55 km/34 miles in length it is possible, certainly during the long summer months, for fit walkers to complete it in one day. However, for most families hiking with kids, it is far more practical to divide the walk into sections. Here, we guide you through section one: Frodsham to Delamere. The trail itself can be considered as easy to moderate in terms of its difficulty and this section is no exception. Whilst Cheshire offers very little in the way of mountainous terrain, the Sandstone Trail does contain several short, steep sections. Navigation is also very straightforward thanks to the yellow and black ‘S’ waymark signs that accompany the route. So, all in all, this is a great trail to get outside with your kids because, for large parts, you’ll be able to give them the freedom to walk significant sections themselves. 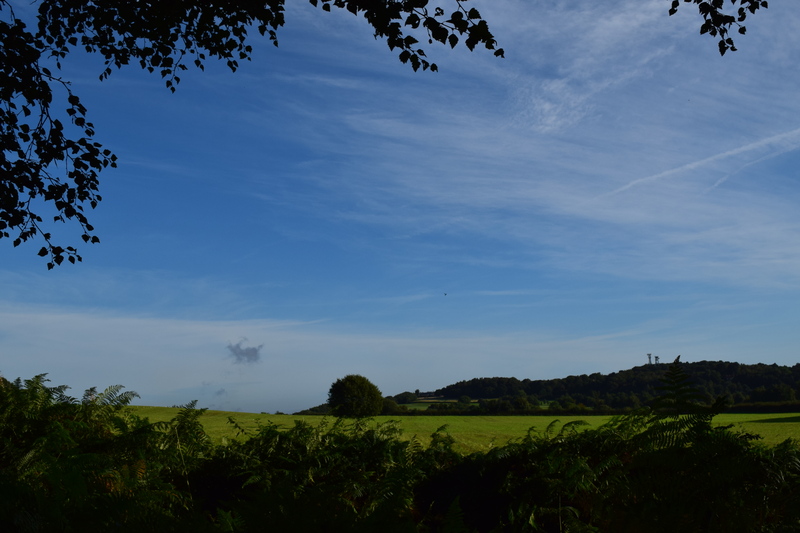 Starting from the sandstone monument outside of the Bear’s Paw pub in Frodsham that marks the northern point of the trail, you will soon find yourself with a steep ascent of Frodsham Hill. Although not technically difficult – it is just a woodland path – it does rise pretty rapidly, so younger walkers may need some assistance. The views from the top, however, where you can see for miles around, are worth it. Just be aware that if you are hiking with young children some of the cliff edges that accompany the next section of the trail are a little exposed, so caution should be taken. As you make your way back into the forest look out for the ancient sandstone rocks that give this trail its name. Some of the cliff are enormous and you’ll gaze in awe at their unique colourations and physical makeup. Steps that enable you to safely navigate these sandstone cliffs are present in a couple of locations along this woodland stretch but, apart from these, the going is pretty flat. Passing the Iron Age Woodhouse Hillfort (that provides an interesting stop off point if you should choose to) will eventually bring you to Snidley Moor Wood, both of which are owned and managed by the Woodland Trust. A little further on, and with the exception of one very dense agricultural field (Seriously, I felt like I was in ‘The Children of the Corn’), the trail now opens out. With an array of beautiful Cheshire countryside vistas you’ll feel the light of day (or the rain and sleet) on your face once more. This provides a really nice contrast to the wooded section you’ve just previously walked and keeps interest levels high among kids. Many of the views on this section are the stuff of picture postcards. They’re the sort of views that visitors from foreign lands conjure in their minds when they think of the British countryside. Top among them is Austerson Old Hall, a 15th Century manor house, which you’ll find yourself stretching through bushes just to catch a glimpse of. For about half a mile the trail does lead you away from the tree-lined meadows and along the busy Manley Road. There is a footpath but take care with children as you’ll need to cross over to reach the kissing gate that leads you up to Manley Common. On your way look out for the Sandstone Trail milestone that is located on the grass verge. It won’t be too long before you’re dropping downhill to enter the fringes of the beautiful Delamere Forest. On your right you’ll notice how the forest has been diversified over more recent years to attract younger users to the dedicated mountain bike trail and skills area. Anyone with young riders may wish to plan a return visit with bikes as there is an array of bike trails, graded in difficulty, to suit both the youngest and most experienced of off-road riders. While you’re in the forest, unless you plan on walking more of the Sandstone Trail, you’ll now want to follow the white ‘Delamere Forest Park’ cycle waymark signs as these will lead you to the well-appointed visitor centre. Here, you’ll be able to replenish your energy stocks until your heart’s content with anything from soup and sandwiches to cakes and ice cream. Obviously if you don’t plan to make the visitor centre your end point, continue to follow the yellow and black Sandstone Trail signs. It’s also worth noting that if you and your kids still have any energy left, there is a Gruffalo Trail that begins not too far from the visitor centre. This opening section of the Sandstone Trail is a delightful walk and the often peaceful and wide open paths of very little real gradient make them perfect for young walkers. However, in my opinion, the best of the Sandstone Trail is still to come. We’ll guide you through section two next time. Yeah this one is one where the kids can walk virtually all of it too, even if they’re pretty young. Thanks for reading. Looks great! Just the right length and difficulty for a day hike with the kids. If things go to plan, we should be in this area sometime within the next six months (we have family nearby) and so we might just give this a try! Thanks for the inspiration! Ah no problem and thanks for reading. It’s a lovely forest, they’ve got a Gruffalo Trail there too if the kids have any energy left. Thanks for reading. Looks like a fab walk, the view from the top of Frodsham Hill is spectacular! Love the idea of the Gruffolo trail as well, Finn is just about at the age when we can start doing things like that together-can’t wait! Yeah I imagine Finn will love it. Thanks for reading. Wow- amazing views. We hiked in southern Colorado when the girls were a 3 and 6 and it really was the best vacation! Ah thank you. I’d love to visit Colorado. Yeah the sandstone rocks really are beautiful – and huge! What a fab walk to explore with young kids, the Sandstone Trail sounds like a great way to get out and explore with little ones with it being mostly flat and so varying in views and areas. This post is fab for anyone thinking of tackling the Sandstone trail with kids as it really does cover which parts to watch out for with the littlies as well as where they can have total freedom to explore. The views really are beautiful up there, it’s fab that you can share this with the kids and they can appreciate their local area. That film scared the living daylights out of me when I was young haha. Thanks for reading. Yeah it definitely scores highly on ease and views. Thanks for reading. Ah thanks so much and thanks for hosting too. You’ve captured some awesome views of the trail there.That sandstone just has so much colour and depth to it, I would bee touching it to see how it felt.Over from Country Kids. Ah thanks and yes the colours of the stone are amazing. Makes you appreciate how old they must be. Ah thanks, the scenery is lovely along this trail. Thanks for hosting. What a great walk, with stunning views and lots of open spaces to run free. Perfect! Thank you. Lucky to have it close by.